chickens | Isn't That Enough? Ethan’s questions still sometimes catch me a bit off guard. I am not sure I ever give him answers that satisfy or even make sense to him. “Grampa eats fruits. If you eat a lot of fruits and healthy stuff, then you can live a long time. I don’t eat that many fruits.” He went back to what he had been doing before. The conversation was enough for him, though to me, rather unsettling and incomplete. There are times when nothing makes sense…to anyone…at all. I had hoped to hide from my embattled reality for at least three minutes. Just as I turned the lock to the bathroom door, I heard the skip that is unmistakably Aaron, embodied, bounding upstairs. He knew where I was; there was no hiding, no refuge to be sought. I was glad that he spoke first, before my annoyed retort for befallen peace sent him away, certainly without skipping this time. That’s why he had come upstairs. That’s what he wanted to tell me: that the sunset was beautiful. He wanted me to see. My little son knew that tonight’s fleeting gift of God’s creation would be worth more to me than a little time alone in the bathroom. My birthday is coming up again. I am keenly aware that I am at the brink of the manifestation of the sunset of my life. While the future had once been something to envision from a great distance, that tide has now caught up to me, and my steps are not defined as I had expected that they might be. They melt; they disappear into a million grains of sand, indiscernible from the tracks of those who have gone before. I wonder how my son, my child who views the world through a black and white lens, would make sense of the loss of a child. I wonder how anyone would. The behavior specialist from Ethan’s school called last week. After analyzing the data from the past year, she was pleased to report that though the incidences of physical holds had increased, the overall challenges with his behavior had decreased to the point where he would be dismissed from her caseload. This, for us, is a type of victory. Are the days that follow the second half of what has already happened, or is it a new start? Is it the end of the beginning, or will there be an entirely new purpose? Olive Chickens (thanks, Elliott, for the middle name) does not appear to know where she is going in a given moment. Her feathers hide her eyes, and one wonders how well she can even see. Somehow, though, she finds her way home, or close to it, at night. Once, though, she almost didn’t. I had taken Ethan to the specialist out of town. The driving rain made travel hard, and it was well after dark when we finally returned to the farm. Dan and Aaron had locked the other chickens down for the night, but Olive, who had been with us for just a handful of days, was nowhere to be found. She was certainly scared, cold, wet, and tired, if she had even been spared. After what seemed an eternity in the darkness of the still-stormy evening, I heard her unmistakable peep. I was a child on Christmas morning: Olive Chickens had wedged herself in a less-than-two-inch wide space between the coop and the run. She was trying to get home. She was scared, but she was okay. With the help of a rake and some urgent prayers, she was soon safely perched with her coop mates. So when the storms are inside, coming from a now medium-sized boy, and they overtake an hour or a day, I remember that we have come far. I remember that the beautiful sunsets had been further between. I only hope that we won’t run out of time before we make it home. When I am gone, when my days are done, I hope that someone will be glad that he is alive, that someone will search for him when he is lost in the storm. Here’s to eating lots of fruits, always finding our chickens amid the thunder and lightning, and never, ever missing out on a beautiful sunset. But there really aren’t any directions, at least not any reliable ones. I thought things were better, but then it comes screaming back. I guess it never quite settles, though it seems to from time to time. We might look okay, like the blooms of sparkling fuschia and the sun’s cheer of yellow that spill boldly forth from the repurposed white enamel pot. Nobody would speculate that they had been picked at, stripped, and stomped on by my curious flock of chickens before being salvaged, repotted, and resurrected to glory. They were almost lost, but it wasn’t time. I did learn, though, in those early years of gardening, that real lavender leaves and blossoms smell just like Yardley of London pump soap, and that this enchanting herb will grow into a fanciful, robust hedge in just a few years’ time. And recently, I learned that the chickens will leave lavender alone. That, to me, is victory. Here comes Wendell with the hand weeder and his pair of gloves to pick the stray grass from underneath the tomato cages. Jenny is not far behind, equipped with twine to tame the snap pea climbers. I really didn’t think that would happen, as some books and articles had promised, but I still don’t recommend adopting the belief that your herbs will be pruned to prize status by your flock. They fertilize the land. What more could I ask for? There will be destruction, devastation, even regret. Things will not come out even, and maybe we will be less confident than before it all began. We will work for nearly nothing, and our bodies will be stiff and sore. We just want to lie down and rest. Maybe it will be seasons, years, even decades before we see the sun. It seems to be ready to peek forth from behind the clouds. There are a few glorious rays, but then we can no longer see. Darkness comes over us, and again, we wonder. I figured out that I can fasten a length of wire fencing into a dome to protect my new plantings. Of course, the chickens can knock them over or pull them apart, but sometimes, what I have done is enough…at least for one small chamomile plug on a windy Sunday morning. The richness of what they have left for us must surely be enough to feed our souls as the land for a while longer. I guess it is best to follow directions, at least the obvious ones. They don’t tell you, though, that even if you plant the impatiens in the shade, feed it with fish emulsion, and provide plenty of water, a curious chicken may still cause it’s demise. We don’t know. How could we ever be expected to? In all of the amazement and surprise of a baby hatching at the farm, I hadn’t given a thought to the true possibility that Kitty May could be a rooster. 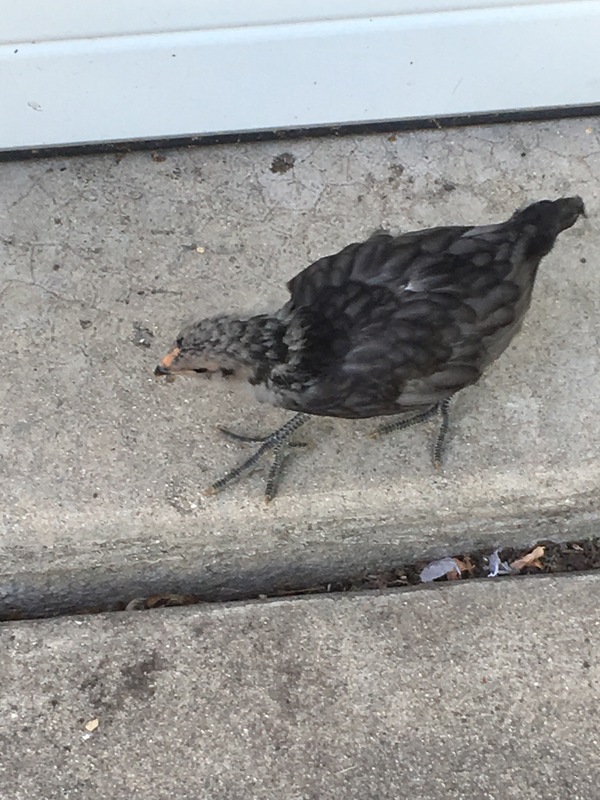 She looks different from all the others, and she seems a gentle, independent, spirited little hen…or rooster. One day, she will either crow or lay an egg, and there will be no more questions. Until this day, though, I am content in my hope that Kitty May will be joining the other girls in the nest boxes. It must be okay not to know. Darkness had long since fallen when I returned from the hospital without my child. When I passed by the garden, there was enough light coming from the window in the main house that I could see that four of my young plants had been uprooted, surely the work of curious chickens. I was tired, so they would have to wait until morning. And I guess it’s alright to wait for lots of other things, too, especially when there aren’t any rules or instructions. It’s just not time yet. This spring, the lavender has come back rich and strong, with just a few bare branches. I know, too, that in time, however long it may take, and even if a new rooster crows on the farm, the holes will begin to fill in, and we will admire the flowers in their magnificent resilience. What’s In Your Egg Basket? Something happened. Something went wrong, or maybe it didn’t. Words that interrupted my idle thoughts as I stood at the kitchen sink, face-to-face with dinner’s aftermath, cannot be taken back. Even as I feel the blood rush through my legs and the empty space grow in my soul, I find solace in a cupcake. It’s the last one, hidden in the back corner of the freezer, leftover from a forgotten celebration. Rich chocolate of the most devilish kind, with a perfectly swirled pink vanilla piped frosting, made extra special with a fairy dusting of sparkling sugar…gone in an instant. The experts would probably call this emotional eating. Alone on it’s plate, it beckoned, and I ate it. If I get out to the coop at just the right time, I can get an egg that still feels warm to the touch. Fresh from it’s laying hen, this egg rides in the cup holder of my car as I take the baby in to town for therapy. It acccompanies me across the road to the mailbox. I hold it gingerly in my hand as I look around the farm, thinking of the blooms that will pepper the summer’s garden and imagining the tiny herd of goats that might one day entertain us in the pasture. Everything seems to hold a bit more promise as I am reassured by the blue-green chicken egg that brings so much to me. It’s an egg. I could get a dozen eggs for a little more than a dollar at the grocery store. After what seemed like two hours but was actually just over ten minutes, I could feel his body melt into mine. He made his way to the pink chair, my favorite one. The storm had subsided, and Dan was home by now. 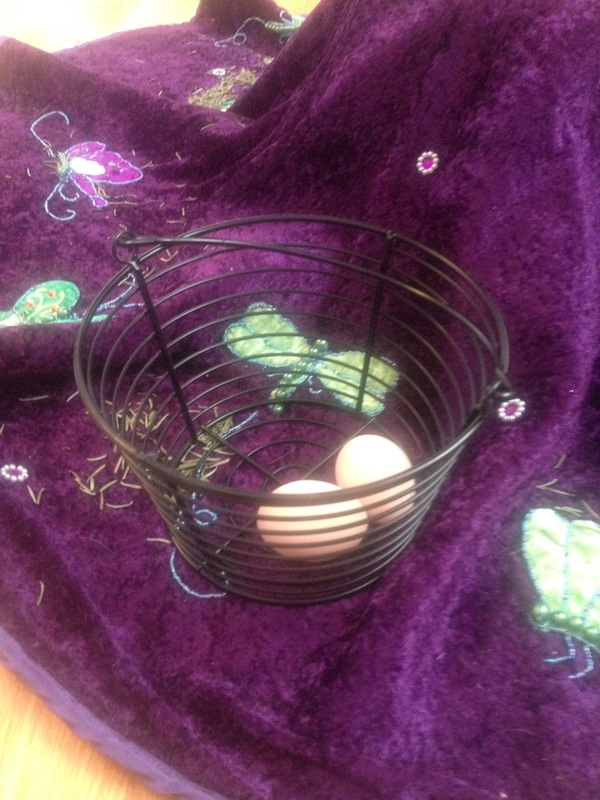 There were no more cupcakes, but I could get my egg basket, and I could see if there were any eggs to gather. Even if the hens were done laying for the day, I would breathe the peace of the outside air and know that in this moment, I am okay. We are okay, right now. Even if I returned to the house with an empty basket, I would know, because of what it represents, that the basket is actually quite full, if not of eggs. There might be different things inside the basket on a given day. Pink sparkly cupcakes, my best well worn sweater, the anticipation of my sister’s visit, my special water bottle, the thought of my fairy roses and my Christmas milk punch: these are in my basket. In it I can also find the way it feels when all is quiet, when I am washing the last plate, when bedtime has blanketed the little ones in a soft hush (at least for a few hours), when I am able to sneak down to the cellar to start my onion seeds in their fresh peat pots, and when the promise of spring is tangible in the form of garden catalogs that have begun to arrive two-a-day by mail. To me, it’s much more than just an egg. There are people, many people, in my egg basket, which is also full of robust donut shop coffee and baseball. These people fill me up when I most need them, and even when I don’t know what I need. One brings me ice cream in the middle of the night, another sends me a message that makes my stomach hurt from laughing, and another came to sit with me and did not mention one word about the cheese that stuck to the bottom of her shoe as she walked through my kitchen. When the questions are bigger than the answers after a quarter century of parenting, when the pancakes burned because I had to step away from the griddle to mediate a fight, when I don’t want to look past today for fear of what I might see, and even when someone has eaten the last secret cupcake, I can go to the chicken coop with my egg basket, and I know that I will feel better for having gone. Experts might think that this is emotional egg gathering. Though I am far from an expert, I think it might be. I don’t think we can really know what is in someone else’s egg basket, at least not everything, anyway. It’s probably not even an egg. For our deepest friendships, yes, we sometimes do know some of what the basket holds, or we can do our best to try to figure it out. And even the thought of someone trying to understand what is inside can be enough to fill it up. When the bread is baking, when my grown son calls to share his excitement at his new venture, when I take a minute to look at my vintage cookie jars, when my daughter’s eyes flash so brightly that I can nearly feel the warmth of her happiness, when the little boys drive their construction trucks in rare harmony, perched together atop the gravel pile; these are the times that I have enough to share my basket with others. I might miss the glory of the Northern Illinois sunset if I don’t hurry out now to close the chicken door for the night. While I am out there, I will be sure to check for eggs one last time. Sometimes, it’s just hard to keep up. This Christmas season, there has been so much good. As I stare at the beautiful plate of sugary goodness: peppermint bark, frosted cookies, candies sprinkled with red and green sugars, delivered by a longtime friend, I worry that in my own struggles to keep up with my daily tasks at hand, I may not truly take in all the sparkle that is around me. I am afraid that I might have trouble keeping up with the kindness. I fear that I will forget to count some of my blessings. All of the little girls could jump rope. All of them, except me. Perhaps I would have been able, but I was afraid to try. Dressed in my Catholic school uniform of a red, white, and blue plaid jumper and crisp white Peter Pan collar shirt, I was content to hold the rope’s end, swinging it in rhythm as the other girls, whose outfits matched mine, lined up to jump Double Dutch in turn. I was content to spend my twenty minutes of recess admiring the fancy footwork and shiny Mary Janes of my classmates. I desperately wanted to be part of their game. “Patty, don’t you want a turn?” From time to time, another girl might invite me to try. Though I may have secretly wished to jump, I never ﻿let go of my rope’s end. I think I was afraid of what might happen if I did. I am pulled somewhere from both sides, into a lonely space where I can find nobody else, nobody like me, and into all of the others, so I, too, can be one of them. Each place may seem right at one time or another, but I wonder if either is where I am supposed to be. His eyes are deep, dark chocolate. Looking into them, I know he sees through me as easily as it is a struggle for me to see inside of him. These eyes, decorated in eyelashes an inch long, can’t share the secrets. He can’t tell anyone. Not yet, anyway, for it’s not time. 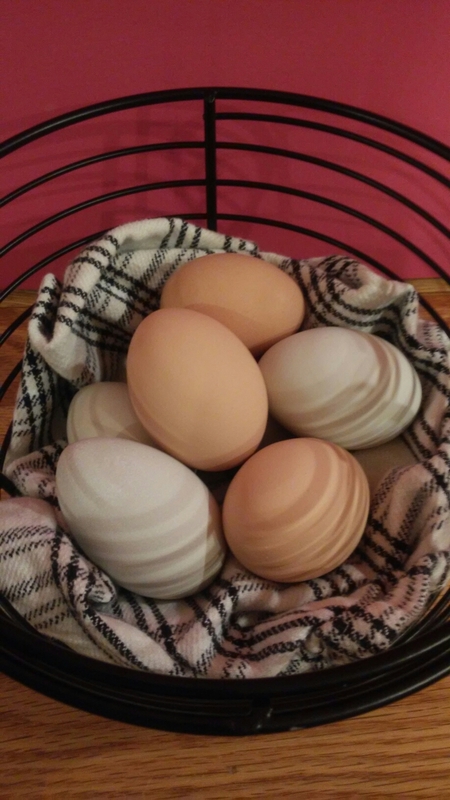 My hens have been prolific egg layers through the summer and fall. We had dozens of fresh, strong-shelled farm-to-table eggs every week. As the hens began to lose feathers while molting, and as the season’s chill had settled in, I should have remembered from what I had read that during the wintertime, egg production will likely drop off. I was still surprised when it happened. My chickens, it seems, are having trouble keeping up. I had to buy a dozen eggs for the first time in many months. I may not have appeared lonely, but I must have been. Now, there is loneliness in the fear, the fear of not being able to keep up with my son. If we spend the whole night waiting for the morning, we wait all day for our chance to lie down and rest. The chickens need sunlight to lay eggs, just as I need his bright spirit to tell me that this is not the end, but to carry on through the nearly barren winter, gathering an egg or two for a day if I am lucky. Gather the lonely harvest in anticipation of spring’s bounty, because that promise of hope, of a peaceful afternoon, of a basket brimming with fresh eggs, is all we have. I will be sure to hold tightly to my end of the rope. I don’t expect to gather half a dozen eggs anymore. Maybe, though, if I go out one last time to check the nest boxes at dusk, when the sky shines pink and gold, there will be just one more egg waiting for me as a reminder to count my every blessing. She wanted to know what she should bake; she was taking suggestions via Facebook. My friend Chrissy is a self-proclaimed therapeutic baker. She’s also a foster mom. She goes to court, she comes home, and she bakes. And lucky are we that live close enough to be her neighbors. Foremost in my mind as the first hints of chill return to the air are Cranberry Bliss bars, which are a couple-times- a-season delicacy from the Starbucks drive-thru. She asked. I have never eaten a cranberry bliss bar while watching baseball. By the time those types of treats are in season, we are heralding the fall season and preparing to deck the halls. This year, though there is a rustle of leaves on the ground and my little boys have already been wearing their new Halloween costumes, I am still listening to balls and strikes being called over the radio. That’s not what usually happens, but I cannot be more grateful. Right now. That’s not what usually happens. But I am so grateful. I have an angel friend who has, on a whim, brought me an entire freezer full of meat that she “happened upon.” She once handed me a tiny screwdriver, part of an eyeglass repair kit, when my daughter’s glasses kept coming loose. Another time, she came to my house with a latte and a six-pack of Cranberry Bliss bars which, she claimed, were on special. I had become so enamored with my hummingbirds that I hadn’t even thought that they might not be here to stay. It had been a while since I had gotten a glimpse of my magical friend flitting near the ruby red feeder which hangs outside the kitchen window. Then came my hard realization: the hummingbird is not coming back anymore, at least not this year. That’s it. There’s a season for all of this: baseball, hummingbirds, and even Cranberry Bliss bars, unless you are Chrissy, and you can bake them whenever you like. “When is it time for me to play real baseball? I think that’s what I am going to be. I was thinking of being a boxer, but I decided I wanted to be something happy, so I am going to do baseball.” He knows. I loved this flow of spoken thoughts from my little boy. He knows: baseball is happy. When it’s not time for baseball, though, we need other things to keep us going. When we learn things we wish we didn’t know, we are, in a way, forever changed. We can’t go back to where we were before, because there is nothing there. What lies before us may be unfamiliar, but it is where we are. No matter who wins the World Series, I plan to enjoy the ride along the way. Chrissy brought me three boxes of glorious cranberry bliss bars and pumpkin scones that day, and I sent her home with a dozen chicken eggs. I know I got the better end of that arrangement. Perhaps she was baking as therapy, to make herself feel better, but she certainly brought some light to my day. She had left less than two minutes before, and my mouth was already stuffed with cream cheese, white chocolate, and cranberries when her text came in. I doubt there’s a season for having chickens in your car. My friend Juli stopped by this morning. She was coming to collect her baby carrier that I had borrowed. “Would you like some applesauce and pie filling?” Would I like some applesauce and pie filling? How is that even a question? Though her chore list was probably longer than the distance between our homes, she took the time to deliver a box containing home canned pints of applesauce and quarts of pie filling. When apples are out of season, we will be happy, and we will be reminded of our sweet friend. As I watched Juli drive away, I wondered if there might be a chicken in her car. I half-hoped there was, because that would mean that she would come back. I just might put my feet up, sneak the best baked goods into the living room, eat applesauce from the jar, and watch the Cubs continue to work their way to the World Series. All the while, I am going to remind myself that even when things are beyond understanding, blessings abound.